This review contains two sections. The first half of this article reviews the book from a general perspective while the second half deals with the book’s implications to vision care and strabismus in particular. Each can be read separately according to your interest but of course you are more than welcome to read the entire review. Enjoy! 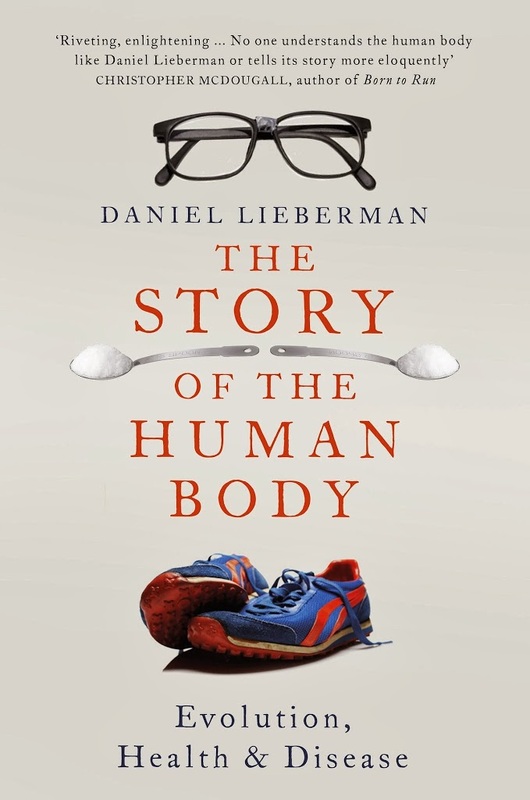 In the first half of the book Lieberman kicks off with a detailed history of how we got to be Homo Sapiens and how every mutation came into being and why. Oftentimes it was climate change or some other major event our hominin ancestors managed to survive at the time. It also magnificently reveals why we are the way we are and why we move the way we move. I leave it up to you to read the book if you want the full story on that. What stood out to me is how seemingly random it all happened and how the evolution of the modern human was not inevitable. It’s like we ‘won the lottery’. I will leave the philosophical debates up to you, but if you can’t handle the fact that we are bipedal primates the book is not going to be much fun for you. A great quality of his narrative is that he doesn’t try to oversell and clearly states what actually can be known by examining the evidence and what are merely hypotheses. For instance, one of the many cool fun facts is that even though Neanderthals have died out, 5% of the DNA we carry has Neanderthal origins due to interbreeding. Also notable, and something every human ought to know, is the fact that we are a genetically homogenous species and apparent differences in looks are literally only skin deep. In short, it’s been an interesting last 6 million years and you are the result. Compared to the entire duration of human evolution, the agricultural revolution and later the industrial revolution are merely blinks of the eye. Agriculture was only invented around 11,000 years ago. Farming is often viewed as an old-fashioned way of life, but from an evolutionary perspective, it is a recent, unique, and comparatively bizarre way to live. This new cultural revolution occurred for good and valid reasons and were mostly beneficial at first. The best way to investigate the effect of past events on the human body is by comparing bodily remains of hunter gatherers and early farmers. Initially height and health of farmers increased. Later on, because of various reasons one of which is population increase, farming was still a boon for the human species as a whole but became a mixed blessing for the individual. Over time farming exposed people to dangerous situations like famine, living of solely one crop and a much higher rate of infectious disease due to higher population and animal densities. In other words, the unfortunate irony of agricultural intensification is that even though farmers produced more food overall, the energy available for each child to grow diminished, probably because they were spending relatively more energy fighting infections, coping with occasional shortages of food, and toiling long hours in the fields. Ever since the agricultural revolution culture has undergone increasingly rapid change to this day. Through cultural evolution rather than natural selection we have learned how to cope with many of the unfortunate side effects of our new farming life style. The book goes on to describe the industrial revolution and how new divides between our biology and cultural evolution came to be and how medical advance often spectacularly helped mitigate the effects of many mismatches. The author also provides interesting insights in how the modern food industry originated and works. We are further removed from our ‘normal’ habitat than ever before and without looking at our own biology through an evolutionary lens we are unaware of the possible risks this entails. Not because I consider something ‘normal’, it is actually normal. Humans have a habit of making new habits without even knowing it. In fact, cultural evolution is taking on such speeds that what was normal to my grand parents and even parents is vastly different from what I consider normal. Increasingly we are creating novel environments for which our ancient genes did not evolve. Even though natural selection is still ongoing, there is no way it can keep up with the blistering pace at which our environments are changing. However smart we are, or we think we are ,we are still a bunch of monkeys whose proliferation and cultural development got ‘out of hand’. Now, the good news is that at this time in history we can start relearning some of our monkey ways to combat health problems our body is developing in response to this profoundly new and weird environment. How awesome is that! The emerging and important new field of evolutionary medicine proposes that,despite much progress since the Paleolithic, we have become like that (out of place) animal in some respects. As innovation has accelerated, especially since farming began, we have devised or adopted a growing list of novel cultural practices that have had conflicting effects on our bodies. On the one hand, many relatively recent developments have been beneficial: farming led to more food, and modern sanitation and scientific medicine led to lower infant mortality and increased longevity. On the other hand, numerous cultural changes have altered interactions between our genes and our environments in ways that contribute to a wide range of health problems. These illnesses are mismatch diseases, defined as diseases that result from our Paleolithic bodies being poorly or inadequately adapted to certain modern behaviors and conditions…. The most basic interactions between culture and your body’s biology are the ways that learned behaviors—the foods you eat, the clothes you wear, the activities you do—alter your body’s environment, thus influencing how your body grows and functions. To be clear, this book does not propose to resort back to our caves and give up advances that have allowed people to survive throughout human history. Today 800 million people are often still struggling to get sufficient food. Yet at this time the number of obese people world wide has exceeded one billion. Affluence seems to have its own risks since we did not develop to deal with abundance and nowadays healthy food is more expensive than junk food. So those of us fortunate enough to live in the developed world are developing all kinds of new problems. Because people have no idea anymore about what is ‘normal’ our daily activities and foods without moderation can lead to debilitating illnesses. Another application of evolutionary medicine is to recognize that many symptoms are actually adaptations, thus helping doctors and patients rethink the way we treat some illnesses and injuries. How often do you take an over-the-counter medication at the first sign of fever, nausea, diarrhea, or just aches and pains? These discomforts are widely regarded as symptoms to alleviate, but evolutionary perspectives indicate that they can be adaptations to heed and put into service. Fevers help your body fight infections, joint and muscle pains can be signals to cause you to cease doing something harmful like running incorrectly, and nausea and diarrhea assist you in purging harmful bugs and toxins. Quick fix solutions can be great when dealing with acute health problems, but we could do a far better job in preventing most of those ailments to begin with. 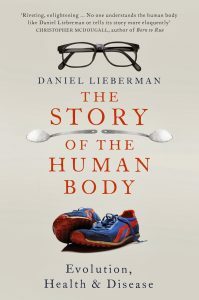 Lieberman does not discard the impressive medical advances accomplished during the last centuries and how they enable us to survive acute health problems. He just points out we can have best of both worlds. If we start being aware of the risks of some modern behaviors and know how to manage them adequately we could be much better off. When illness logically finds you because of the way your biology interacts with some behavior or foods, many doctors often deal with the symptom, rather than come up with a structural solution, starting costly negative feed back loops aggravating the problem in the long haul. While as a matter of fact some ailments can simply be prevented or treated by changing behavior. Many medications are available for treating hypertension, but the best treatment is also the best form of prevention: good oldfashioned diet and exercise. Therefore, like cavities, high blood pressure is a common case of dysevolution because even though we know how to lessen its prevalence, our culture creates and passes on the environmental factors that cause the condition and keep it common. As chapters 10 through 12 explore, similar feedback loops help explain the incidence of type 2 diabetes, heart disease, some forms of cancer, malocclusions, myopia, flat feet, and many other common mismatch diseases. To get the full benefit of the illuminating descriptions of mechanisms through which very ‘normal’ or common behaviors might contribute to those ailments I recommend for you to read this book. When reading some books I really feel privileged to acquire the knowledge offered by that particular book and this is one of those books. I’m happy to have learned this information so I can make informed decisions in the future. Nevertheless I will come back to myopia later in this review. Towards the end the author points out this shift in health care is not going to be easy. It’s very profitable to sell comfortable objects and foods we instinctively ‘can’t get enough of’. Moreover, the medical system is skewed in such a way that it promotes all kinds of accommodating gear, medication and expensive surgeries. Behavioral change is much less profitable and harder to sell. One often has to be really well-informed and have a healthy dose of skepticism towards doctors to find out about more structural long term solutions. Clearly this is no different in the vision care business. In the final chapter, he proposes various policy adjustments and how he thinks they would play out in trying to improve general prevention efforts taking into account our ancient cravings for comfort and ‘unhealthy’ foods and our new environment. Sadly much money is being spent on keeping negative feedback loops going rather than preventing them from occurring. Preventive medicine is not only the best kind of medicine, it’s also the cheapest kind. The dramatic successes of pediatrics during the twentieth century prove that preventive medicine really is the best medicine. My (the author’s) grandfather (who was a doctor) died in the early 1980s, but I am sure he would despair at the state of preventive medical care for children today in the United States. The majority of American children still get regular checkups, inoculations, and dental care, but 10 percent of them don’t because of poverty and poor access to health care. The percentage of low birth weight babies, now 8.2 percent, has not declined in decades and in fact has been rising recently, even though low birth weight substantially increases a child’s risk of dozens of short-term and long-term health problems. In 1900, Americans were, on average, the tallest people in the world, but today they tend to be shorter than most Europeans. To me, binocular problems or strabismus are one of the most clear cases of a mismatch disease. I have a very hard time believing one could have genes that predispose you 100% to be cross-eyed. I have some papers lined up about strabismus and genetics but I doubt that they will be very earth-shaking in that respect. Even if there is such a thing as a 100% genetically predisposed strabismic, it will be a small minority among the actual strabismics. A good point about using an evolutionary perspective is that when studying a phenomenon we shouldn’t compare someone with a particular disease to a supposedly healthy person who grew up in an industrial environment. To really get an idea of what is ‘healthy and normal’ we should try to learn from the bodily evidence that our paleolithic ancestors left us. That would be a whole other story since nothing in biology makes sense unless seen in light of evolution. For instance, the visual system must have evolved over millions of years in order to make us excellent hunter gatherers. Distinguishing colors, having a good panoramic overview of landscapes, judging distance, interacting vigorously with the world resulting in an agile and flexible visual system. I’m working on a blog entry on ‘loading’, meaning the application of learned visual skills during Vision Therapy in real life activities. I think hunting and gathering would be an excellent form of ‘loading’. Knowing this, writing and reading are a fairly ‘risky’ new behaviors and was only invented 6,000 years ago. In his book ‘The Mind’s Eye’ Oliver Sacks ponders the question how we managed to invent script, reading and writing from a neurological perspective. He proposes that we didn’t evolve to read and write but rather that we ‘recruited’ brain areas that evolved for other practical uses which eventually enabled us to invent something completely new by combining them. I am the first person to marvel at such ingenuity but advanced behavior like reading are are not really ‘normal’ in the evolutionary sense of the word. Obviously the benefits of reading outweigh the risks and it has brought us plenty of good. Nonetheless reading could be even more beneficial to mankind if we learned how to manage the risks it brings to the human visual system. A problem can be caused by environment and behavior so it can also be solved by environment and behavior such as visual training. The author did mention the myopia epidemic that sweeps the globe as a result of intensified reading and electronics use. He clearly understood the idea of how and why vision changes. But I would almost say myopia is a ‘beneficial’ adaptation to our new environment which in general leads to easier reading, higher income and more socio-economic success. So it is clear our new environment brings out more myopia in those genetically predisposed to it and cultural innovation like glasses and invisible contacts help them cope. However, extreme myopia too can be managed through accommodation training and life style changes. That being said, Lieberman didn’t seem to realize there are far more crippling and fundamental evolutionary vision mismatches in our day and age. Myopia is basically cramping of the ciliary muscle in the eye making it hard for one to adjust his eye lens. My point being that the problem is situated ‘mostly in the eye’, which is just the tip of the iceberg of the visual system. Things do get much worse when novel environments inhibit normal binocular brain development and vision development goes rogue. In fact people who are genetically predisposed for clear viewing at mid and long distances often experience visual overload when they try reading at a young age without appropriate glasses. This often leads to amblyopia and/or strabismus. These are brain disorders. The brain is the core of a person so you don’t want to mess with that or more trouble is in store for you and society. Without managing those risks associated with long hours of short distance viewing, people with a good ‘hunter gatherer vision’ predisposition undergo abnormal vision development because of cultural pressures and can eventually even be excluded from society of it. I often mention the added risk of strabismus for farsighted people or hyperopes but myopes can also be at risk. Frankly, I have a very hard time believing that one could develop strabismus when having to live a hunter gatherer life style. Vision Therapy actually includes training many basic visual skills that would be crucial to hunting and gathering. Even if you were ‘born cross-eyed’ one would have to grow out of it and strengthen the visual system similar to Vision Therapy. Now, THAT is a really interesting evolutionary mismatch that affects one in five people. Taking into account both those who are suffering from manifest and intermittent strabismus. We consider this the new ‘normal’ but if we start using our brains we can reinvent what’s normal and drastically reduce binocular vision problems. It will not only be better for our health and productivity but it will also be cheaper for society in the long run. I am not the first one to notice or realize this by the way. Look at this excerpt from ‘Optometric clinical practice guidlines for the care of patients with accommodative and vergence dysfunction‘ by the American Optometric Association. In previous generations, when survival depended on the ability to hunt, fish, and farm, the visual system had to respond to constantly changing, distant stimuli. Good distance visual acuity and stereoscopic vision were of paramount importance. Today, the emphasis has shifted from distance to two-dimensional near vision tasks such as reading, desk work, and computer viewing. In some persons, the visual system is incapable of performing these types of activities efficiently either because these tasks lack the stereoscopic cues required for accurate vergence responses or because the tasks require accommodative and vergence functioning that is accurate and sustained without fatigue. When persons who lack appropriate vergence or accommodative abilities try to accomplish near vision tasks, they may develop ocular discomfort or become fatigued, further reducing visual performance. Accommodative and vergence dysfunctions are diverse visual anomalies. Any of these dysfunctions can interfere with a child’s school performance, prevent an athlete from performing at his or her highest level of ability, or impair one’s ability to function efficiently at work. Those persons who perform considerable amounts of close work or reading, or who use computers extensively, are more prone to develop signs and symptoms related to accommodative or vergence dysfunction. Symptoms commonly associated with accommodative and vergence anomalies include blurred vision, headache, ocular discomfort, ocular or systemic fatigue, diplopia, motion sickness, and loss of concentration during a task performance. The prevalence of accommodative and vergence disorders, combined with their impact on everyday activities, makes this a significant area of concern. As I see it, strabismus is a mismatch disease to be monitored and treated when the visual system exhibits deviation from its healthy developmental trajectory. Often children develop strabismus and the suppression of one of both eyes as a temporary adaptation helping them cope with a stressful visual task in the here and now but when this way of seeing persists over the long haul it will have serious drawbacks. If not treated, vision imbalances in the brain will often lead to imbalances in body posture. Examples of these are people tilting their head in odd angles, turning their body to one side, cramping facial muscles in an attempt to compensate for their unstable vision. Another indication that strabismus doesn’t just magically appears but it develops in response to environmental demands. Sadly today most doctors still don’t understand this and keep the negative, expensive feedback loops going. Strabismus is curable and when talking about accommodative strabismus it is downright preventable. Earlier passages from the book mentioned in this review definitely apply to the vision care system or, as I like to call it, the strab-business. The medical system is skewed towards treating the symptoms (eye muscle surgery, ADD medications, …) rather than causes and it will take a while before people’s minds can be changed and we can fully enact this paradigm shift. Strabismus is not so much a medical mystery anymore,as it is a structural social problem. Sure, we don’t know every little detail about strabismus (even though we know a lot already) but that shouldn’t stop us from using common sense and do the right thing. Not treating strabismus based on what we already know about the brain and only fiddling with its aesthetics leads to what Lieberman calls dysevolution. The word is very accurate in describing the process. It’s very cruel to subject children or adults in need of vision help to dysevolution especially when it can easily be avoided. When someone suffers from a disease we don’t know how to cure, it’s a tragedy. But if someone suffers from a disease we know how to prevent and cure, it’s a disgrace. The majority of vision care professionals can do better and should do better. If this content has been helpful to you, consider donating a few bucks to keep it coming. Thank you!